Dividing peony crowns successfully will yield flowers within a year after division. Peonies are long-living perennials that bloom for decades with little care. Peonies will not grow true from seeds, and the seeds will take up to seven years to bloom. Propagating the peonies by division of the tubers reliably grows new and healthy plants. Dividing a single peony in the fall can result in many new plants in the spring. Propagate the peonies when the foliage dies down in the fall. Cut the foliage down to 2 inches to make it easier to locate the buds. Dig a circle 8 inches away from the base around the peony crown. Continue to work under and around the crown until you can lift it out of the ground with your shovel. Remove the dirt off the crown by spraying it off with a garden hose. Count the total number of buds on the crown and divide them into groups of three. Allow the crown to dry before you divide it. Dig 8-foot deep holes that are 8 inches wide for every three buds on the crown. Select a growing location that receives at least 6 hours of sunlight. Fill the holes with 6 inches of garden mix that contains equal parts of manure, soil and peat moss. Break the clumps apart in the remaining soil and add an equal amount of well-rotted compost. 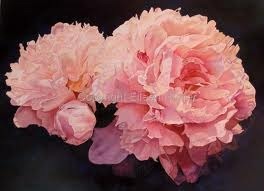 Cut the peony crowns into crowns that contain three to five buds with a sharp knife. Apply a fungicide powder over each cut to help protect the flesh. Create a small hill in each planting hole for the crown to sit on to keep the buds 1/2 inch below the surface. Fill the hole with the leftover soil and spread the roots. Water the peony divisions well. « When Can I Divide My Peonies?